Apple MacPro Late 2013 6.1 Xeon 3.7 64GB RAM 256GB SSD. Condition is Used. Dispatched with eBay delivery – Shutl 1 day. Apple iMac A1418 21.5" i5 2.9GHz Desktop (Late, 2013) 8GB RAM, 1TB. Condition is Used. Shipped with USPS Priority Mail. Apple iMac A1418 21.5" Desktop - MK142B/A (October, 2015) Graphic Intel HD 6000. Condition is Used. Dispatched with eBay delivery – Shutl 1 day. Dell Precision T3620. Nvidia Quadro K620 2GB Graphics Card(Supports quad monitors). 500GB Hard Drive SATA (Storage). 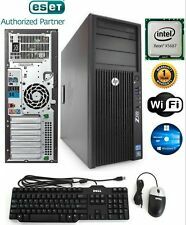 HP Workstation Z420. 500GB HARD DRIVE. Windows 10 PRO 64BIT. Genuine Microsoft Windows software preinstalled. WINDOWS 10 INSTALLATIONCD AND NEW COA STICKER IS INCLUDED. An item that has been used previously. Hard Drive - 1TB SATA HDD. Machine Type - All In One. 1TB Hard Drive (Upgrade from original 500GB HDD) • Nvidia Quadro K620 2GB Half Height Graphics Card. Hard Drive - 500GB SATA HDD. Machine Type - All In One. Adobe CS6 Ableton Live 10. For Professional creative designers. This iMac has been upgraded to 4GB RAM (supports up to 8GBs) and a 320GB hard drive. This iMac is a workhorse. Model. A1224 iMac 9.1 | MC015LL/B. Refurbished iMac. 500 GB HDD. Our Product Note FREE 12-months Warranty. As part of the sale you"ll receive. Great Condition HP Z230 WorkStation. - 256GB SSD. - 16GB RAM. - Windows 10 Professional 64 bit. Windows 10 Professional 64 bit. Dual E5-2630 V3 2.4GHz Processors – 32GB ECC – 2TB SATA – K4200 Video Card. 4GB NVIDIA Quadro K4200 Graphic (DVI 2x DP). NVIDIA® Quadro K4200. Lenovo ThinkStation P700 Professional Workstation. Max Storage Devices - 12. We can provide a fast UK dispatch. Our warehouse is situated in (Heathrow). This iMac is in Excellent working condition.A GRADE. Model Identifier : iMac 14,2. Hard drive Capacity : 1TB. Manufacturer warranty. Up for sale is a Dell Precision T7600 workstation/desktop. This machine has been refurbished and is fully tested. This system is pre-loaded with a factory install of Windows 7 Professional SP1. This system will be ready to go out of the box! 500 GB HDD. FRESH INSTALL OF MAC OSX HIGH SIERRA. UNIT AND POWER LEAD ONLY. FULLY TESTED IN WORKING ORDER. Hard disk: Seagate Desktop HDD ST500DM002 500GB 16MB Cache SATA 6.0Gb/s 3.5" Internal Hard Drive. Processor: AMD FX-4130 3.8Ghz Quad Core 4MB L3 B2 Socekt AM3 . DVD/CDROM: Optiarc ad-5200s – Disk drive – DVD ± RW (± R DL) – 20x/20x – Serial ATA – internal – 5.25" – black. AMD Firepro W7100 Graphics Card(Supports quad monitors). Dell Precision T3620. 1TB Hard Drive SATA (Storage). Hard Disk Capacity 500GB. Workstation PC. DVR-RW Drive, 6 USB Minimum. Genuine Windows 7 64bit Professional. Case may have marks but it does not affect its functionality. 100% TESTED WORKING. Free unlimited Security Essentials. This IMAC is in perfect working condition. 1 TB FUSION. Model Identifier : IMAC 14,1. Hard drive Capacity :1TB FUSION. Hard Drive Capacity APPLE WIRELESS KEYBOARD MOUSE. Manufacturer warranty Product Family. DELL Precision T1700 SFF. Storage: 250GB SSD. RAM: 16GB DDR3. Optical Drive: DVD Writer. Board Form Factor Compute Stick. Embedded Storage 32 GB. Processor Graphics. Graphics Output HDMI 1.4b. Included Storage 32GB eMMC. Security & Reliability. Socket Soldered-down BGA. Low Halogen Options Available See MDDS. HP Z220 CMT WorkStation. Storage (HDD & SSD): 1TB 180GB. Form Factor: Workstation. Graphics Card: NVidia GeForce GTX 650. We can only apologize for this, and hope this does not cause you any problems. Model: Z800. Graphics Card: Nvidia Quadro 4000. Storage Size: 2TB. Series: Z Series Workstation. MAX RAM Supported: 192GB. Bonanza Deals - has the BEST deals - we match our prices to most of our competitors. The screen and case of this iMac are in beautiful condition, with only minor wear and tear visible (normal scratches and scuff from being moved around, but no dents, cracks, scrapes or gouges at all). 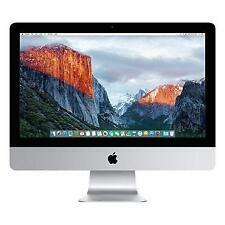 Apple iMac 27" QUAD CORE i5 3.2GHZ RAM 16GB 1TB 2012 A GRADE SPECIAL OFFER!!!!! Apple iMac 27" QUAD CORE i5 3.2GHZ,RAM 16GB,1TB MODEL 2012 A GRADE 6M WARRANTY. Apple iMac 27" QUAD CORE i5 3.2GHZ,RAM 16GB,HDD 1TB HD. This iMac is in Excellent working condition. Model Identifier : iMac 13,2. Apple iMac A1312 27"Quad Core i7 3.4 Ghz,Ram 16GB 1TB (Graphic card 1GB). A1312 (EMC 2429). 3.4 GHz Core i7 (I7-2600). We can provide a fast UK dispatch. Our warehouse is situated in (Heathrow). This IMAC is in perfect working condition. Product Model #: 10MR0004US. Product Model # 10MR0004US. ThinkCentre M710q 10MR0004US Desktop Computer. Product Series: M710q. Product Model: 10MR0004US. Manufacturer Part Number: 10MR0004US. Processor Type: Core i5. Late 2012 Apple Mac Mini (1347).